Christopher Nolan's first feature-length film is a compelling, Hitchcockian thriller centered around a wannabe writer who follows people for source material, a seemingly innocent obsession until he follows the wrong man, thus beginning a dangerous descent into the London crime world. 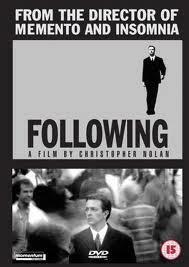 Written, directed, and filmed by Nolan, "Following" has a very prominent neo-noire feeling to it, particularly in the raw grittiness in the filming (right down to the usage of natural lighting in most of the scenes). This often gives the film a claustrophobic feeling and actually makes the viewer feel like we are the one intruding in these people's lives. But this also makes the breaking down and rearranging of the chronology of the story a little confusing at times, especially once the twists start happening in the second half. I think Nolan is one of the greatest living directors, and film buffs should appreciate a chance to see the same visionary bravado he's displayed in "Memento," "Inception," and his Batman trilogy in its infancy. Comedian and one-time Stoner of the Year (a title we should all aspire to) Doug Benson puts his own take on Morgan Spurlock's "Super Size Me," except here he quits smoking marijuana for 30 days just so he can do nothing but get high nonstop for 30 more days. I'll admit to normally not being a fan of Benson (who is probably most famous for his constant appearances on VH1 programs geared towards remembering bygone decades) and half expected this to be nothing more than an outlet for him to force his comedy routine on us, but I was actually surprised with just how far this documentary went, particularly when it came to showing how dicey California's marijuana laws can be in regards to the rights of law enforcement (we get to see a culmination of this in the raiding of several marijuana dispensaries by the DEA). One highlight includes the battery of tests Benson's subjected to throughout his withdrawal and subsequent marathon stoning—many of which have surprising results that challenge the "permanent damages" of marijuana use often argued in the debate for legalization. A cartoon set in the midst of the video game boom of the 1980s, "Code Monkeys" is about a group of programmers at Gameavision, a Pixar-type fantasy workplace that was recently sold to an out-of-touch billionaire. Chaos ensues. But while the premise is rather trite, what made me take notice was "Code Monkeys" is styled after early 8-bit games from the music to the animation to the character design, and often includes references to classics such as "Marble Madness," "Spy Hunter," and "Mega Man." The problem is its look is all it has going for it. "Code Monkeys" often tries way too hard to be funny with little result. The characters are classic tropes we've seen before (the well-meaning protagonist, the slacker best friend, the rich Texan, the dumb meathead, etc.) and a lot of its humor relies on remembering this is set in the '80s (meaning we should find jokes about the home computer being dead and David Lee Roth never leaving Van Halen funny, right?). In the end, "Code Monkeys" is not as edgy or crude as it strives for, but anyone who spent their youth parked in front of a NES will appreciate a viewing.